iMacsoft DVD to Mobile Phone Suite is the powerful DVD to Mobile Phone Converter and Mobile Phone Video Converter suite designed just for Windows users who want to enjoy their DVD and video files on Mobile Phone. iMacsoft DVD to Mobile Phone Suite includes two powerful products: DVD to Mobile Phone Converter and Mobile Phone Video Converter. iMacsoft DVD to Mobile Phone Converter is a powerful and easy-to-use DVD to Mobile Phone converter, which can fast rip and convert DVD to 3GP, 3GPP, ,MP4, AVI, WMV video formats and WMA, MP3, AAC, M4A audio formats for iPhone, iPod, PSP, Palm, Pocket PC, and various brands of cell video phones including LG, Motorola, Nokia, Samsung, and Sony Ericsson and so on. iMacsoft Mobile Phone Video Converter can convert regular video formats to 3GP, 3G2, MPG, MPEG, MPEG2, MP4, AVI, WMV video formats and WMA, MP3, AAC, M4A audio formats for iPhone, iPod, Sony PSP, Palm, Pocket PC, and various brands of cell video phones including LG, Motorola, Nokia, Samsung, and Sony Ericsson Sony Ericsson and other popular mobile phone players. iMacsoft DVD to Mobile Phone Suite is an extremely easy to use DVD to Mobile Phone Converter and Mobile Phone Video Converter. Free download iMacsoft DVD to Mobile Phone Suite and turn your mobile phone to a moving theatre right now! iMacsoft DVD to Mobile Phone Converter can fast rip and convert DVD to Mobile Phone 3GP, 3GPP ,MP4, AVI, WMV video formats and WMA, MP3, AAC, M4A audio formats with super fast DVD ripping speed and excellent quality! iMacsoft Mobile Phone Video Converter can convert regular video formats to 3GP, 3GPP,3G2, MPG, MPEG, MPEG2, MP4, AVI, WMV video formats and WMA, MP3, AAC, M4A audio formats. The converted video and audio files can be played on all popular portable devices like Apple iPhone, iPod, Sony PSP, Palm, Pocket PC, and various brands of cell phones including LG, Motorola, Nokia, Samsung, Sony Ericsson and other popular mobile phone players. iMacsoft Mobile Phone Video Converter allows users to choose start point and duration at will. iMacsoft Mobile Phone Video Converter lets you edit the output MP3, WMA ID3 tag info including author, album, genre, etc. in profile settings panel. iMacsoft Mobile Phone Video Converter and DVD to Mobile Phone Converter allow you to preview DVD or input video files before conversion. iMacsoft Mobile Phone Video Converter allows you to easily check the parameters of the source files including bit rate, frame rate, duration, sample rate, channels, etc. to make video conversion more convenient. 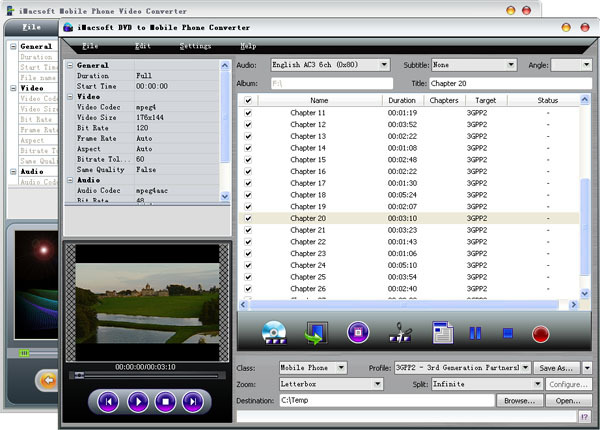 iMacsoft DVD to Mobile Phone Converter supports various functions which allow you to trim video, customize and split output file size, rip DVD's any titles and chapters, select subtitle and audio track, set bitrate, resolution, and frame rate, etc. iMacsoft DVD to Mobile Phone Converter is a powerful and easy-to-use DVD to Mobile Phone converter, which helps you fast rip and convert DVD to 3GP, 3GPP, ,MP4, AVI, WMV video formats and WMA, MP3, AAC, M4A audio formats for iPhone, iPod, PSP, Palm, Pocket PC, and various brands of cell video phones including LG, Motorola, Nokia, Samsung, and Sony Ericsson and so on.